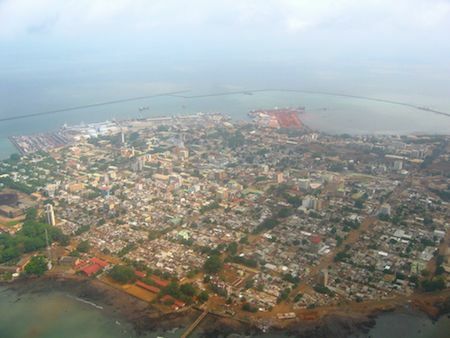 Conakry is the largest city and the capital of Guinea. Located on coastal islands and a peninsula that juts out into the Atlantic Ocean, it is also the nation’s chief port. In 2011 its population was estimated at approximately 1,786,000 people. The city was founded in 1884 on Tombo Island by French settlers although its political control remained in dispute until Great Britain officially ceded to island to France, which was consolidating its control over the entire colony of Guinea. Conakry was founded on land belonging to the Susu (Soussou) people. The name “Conakry” originally referred to a nearby Susu fishing village. Conakry became the capital of French Guinea in 1904 and was the seaport terminus of the only railroad in the colony. The layout of the city was influenced by the early French settlers. Conakry is divided into quarters with a number of large tree-lined boulevards inspired by Paris and other French cities. Originally the city was only on Tombo Island but has since expanded to include the Iles de Los and the Kaloum Peninsula which is connected to Tombo Island by a causeway. The climate of Conakry is tropical with temperatures ranging from 70 to 90 degrees Fahrenheit and high humidity throughout the year. Most of the surrounding area is swampland. In 1958 when Guinea gained its independence from France, Conakry had only about 50,000 people. After independence, the city grew rapidly to 600,000 in 1980 and to its nearly two million people today. Since independence the majority of Conakry’s population has been made up of people belonging to the Peuhl, Malinke, and Susu nations, virtually all of whom are Muslim. Conakry is also home to many refugees fleeing the civil wars in Liberia and Sierra Leone. Most of the population of Conakry lives in poverty and suffers a high risk of contracting a variety of diseases including malaria, and AIDS. It is estimated that only 3.6% of the total population lives past the age of 65. Conakry’s economy is mostly dependent on trade due to Tombo Island’s natural deep-water harbor. Conakry’s main exports include bauxite, alumina, gold, coffee, and fish. In addition to trade, Conakry also has a large industrial district located on the Kaloum Peninsula which manufactures a variety of goods especially aluminum and plastic products. At nearly two million people, Conakry has almost one quarter of the population of Guinea. It is also Guinea’s educational and cultural center, the home of the University of Conakry as well as many museums, art galleries, and other tourist destinations. In 2014 Conakry faced a new health challenge as its citizens had to cope with the ebola epidemic.